Cover This cover gives the first view of the new space-based Legion Outpost, which looks (not surprisingly) like an inverted rocketship. Tin of the Metal Men is in the lower-left corner, behind the UPC code. The four Legionnaires to the far right, near the Outpost, are difficult to identify. The one above Star Boy is Element Lad, and the bulky green one above him is Monstress. Process of elimination identifies the other two as XS and Kinetix. 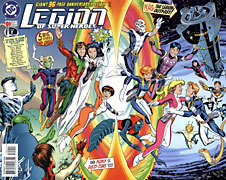 Unfortunately, Shvaughn Erin did not get included on the cover, despite returning to the 30th century with the Legionnaires. A. Hereafter, Phase is always merged with Apparition, and is only tracked separately should she appear separately.